Für den Summit-Tag am 13. 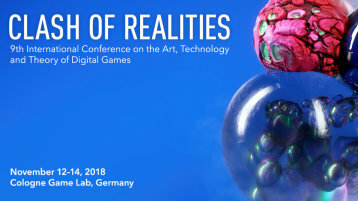 November 2018 auf der „Clash of Realities Conference on the Art, Technology and Theory of Digital Games“ bittet das Institut für Medienforschung und Medienpädagogik der TH Köln um Einreichungen für den Media Education Summit. In Workshops, Kurzvorträgen o.Ä. sollen zum einen bereits erprobte medienpädagogische Projekte und Methoden sowie innovative Konzepte und Ideen präsentiert und diskutiert werden, die zur Reflexion von und kreativen Auseinandersetzung mit dem Summit-Thema „Inclusive Worlds of Games“ einladen, zum anderen wird auch um die Einreichung empirischer Studien aus dem Bereich der digitalen Spieleforschung oder theoretische Beiträge gebeten, die sich mit Inklusion und Teilhabe im Bereich digitaler Spielekultur befassen. Digital games are continuously gaining in popularity as a leisure activity. In addition to their entertainment value, digital games are receiving more and more attention for their educational potential. There are numerous indications that games not only promote social, strategic and motor skills, but they can also broaden the player’s perspectives in general. Digital gaming worlds offer potentialities not only for developing skills, but also for identity formation and community-building. It turns out, however, that not all people can participate equally. Both from a technical and a social perspective, access to digital gaming worlds is oftentimes made difficult or denied, and exclusion processes continue to take place. In light of our goal to provide inclusive media education in digital gaming culture, the question arises: what types of technical and social barriers prevent people from participating? At the same time, it is necessary to discuss what political, cultural and educational measures are necessary in order to increase opportunities for participation, to reduce problems deriving from communication culture and to promote inclusive media education in digital gaming worlds. Deadline for submissions is July 13, 2018. You will receive a reply by August 18, 2018.
spielraum@th-koeln.de / 0221 8275 3641.